If you’re looking for a great way to spend the 4th of July look no further than Big Bear Lake. Every year 80,000 to 100,000 guests flock up to the mountain for our annual celebration, as Big Bear Lake’s fireworks display consistently ranks as one of the top five in California. The fireworks are shot off from a barge on the lake so many of our cabins and picnic areas are perfect for viewing the show. This year’s event will begin at 8:45 p.m.
From July 2-4 there’s also a festival going on at the Big Bear Convention Center that includes live entertainment, children’s activities, a petting zoo and hand-made arts, crafts and collectibles. Visit http://www.bigbear.com/things-to-do/special-events/4th-of-july/ for the entire schedule of events for the weekend. One of the most relaxing spots to enjoy the holiday weekend festivities is at Big Bear Frontier. Guests can park near their cabin or room and participate in most of the activities by walking a short distance to the dock or beach. There you can fish or visit the marinas to rent a boat or go parasailing. Dock your boat and have a family picnic right by your cabin or in a spacious park on the lake. Or venture into town and enjoy the activities in the Village including the Alpine Slide, great restaurants, shopping, etc. During the holiday weekend you’ll see guests boating, fishing, strolling in the village, mountain biking, BBQing, spending family time, and at the end of the evening, enjoying the ultimate highlight, the fireworks! The Big Bear Rotary Club is responsible for our annual fireworks. Each year thousands of people gather around the lake to view the beautiful display. Guests can take a short stroll to the grassy area, the public deck or dock, or just step out on the deck of their cabin to enjoy the awesome show. Guests have exclusive rights to the property for the show each year so you won’t have to fight the crowds if you stay with us. 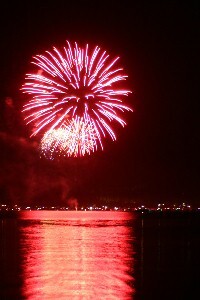 Because of our location on the lake some of the best spots to view the fireworks are right here at Big Bear Frontier. We do have a few cabins and rooms left for July 4th. Call today or visit our website to reserve your spot. Gallery | This entry was posted in What to see and do and tagged 4th of July, Big Bear CA, Dining, family, fishing, vacation, What to Do. Bookmark the permalink.